Sean forthun sent us a picture of this beautiful North Dakota 10 point buck. Sean got a complete pass through on this deer and it ran only 50 yards before it turned, looked back, and fell over. 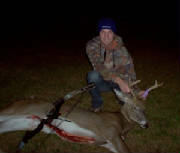 He took this deer with a 2 piece ACS bow and an Abowyer Broadhead. Here is Todd Zolkosky with a nice buck he shot at 15 yards quartering. 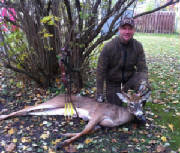 Todd was using a Toelke Super D longbow 55@30, 31" FMJ 400 and 200 grain Abowyer Bonehead. The arrow went through his left lung and penetrated the heart. The deer dropped where he stood for a zero yard recovery! Nice shooting Todd and keep the pictures coming. 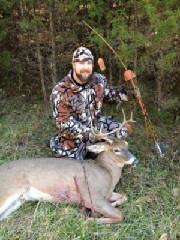 Here is Kevin Weiss from Ohio with a very nice buck he took with an Abowyer Broadhead. 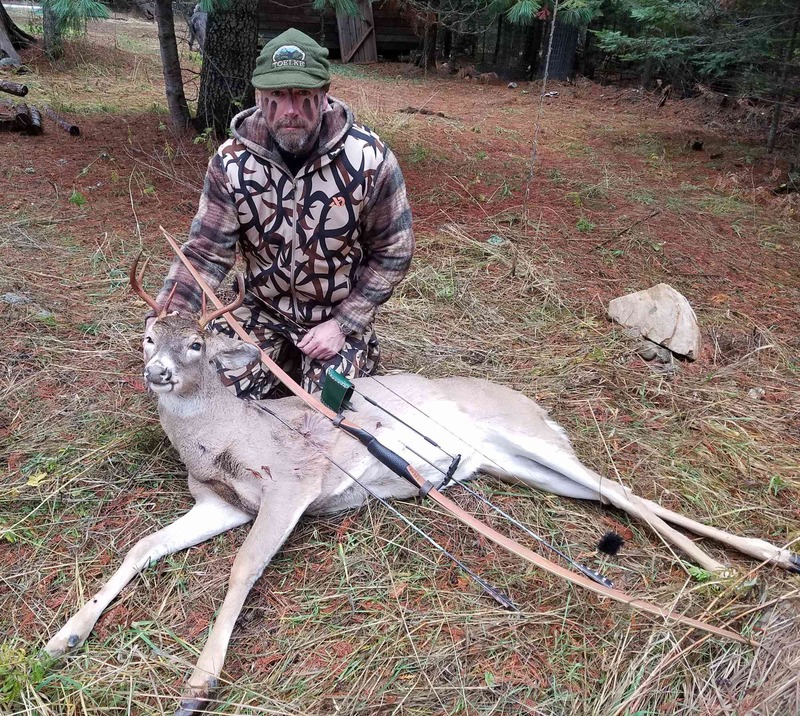 Kevin was shooting a 56# @28" Robertson Primal Styk bow, a 175 grain Abowyer Brown Bear broadhead, and was using a 31" Douglas Fir arrow to get a total arrow weight of 610 grains. Nice shooting Kevin! Here is Zack Knick from Greenville OH. 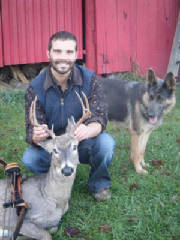 Here is what Zack has to say about his hunt taking this nice doe. 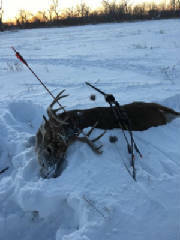 "I took this doe last year with my 55# predator recurve and a 145gr Abowyer Bonehead and traditional only shaft. 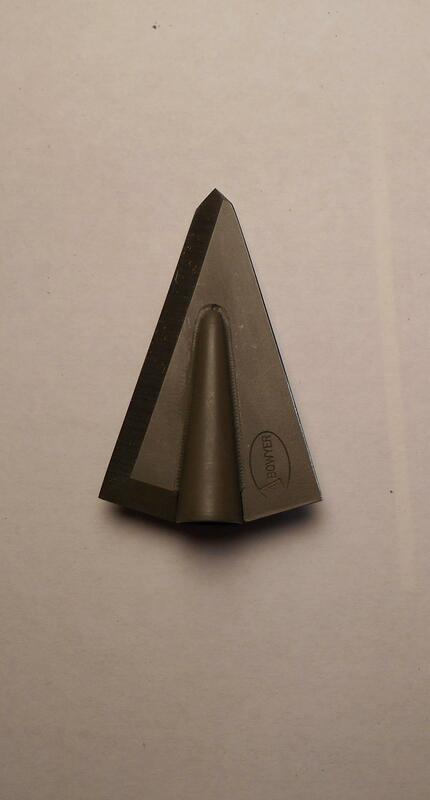 I used other broadheads when I first started hunting with traditional equipment. Then I bought 6 abowyer boneheads and I don't plan on switching to any other broadhead. Can't wait to use them again this fall!" 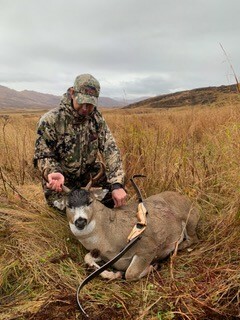 Here is a buck Phil took using his #58 Black Widow PMA with an Abowyer Brown Bear broadhead. Well done Phil! Here is Bryan George with a big buck we watched grow up for 3 years. Well looks like Bryan decided this year was time and harvested this great trophy. Bryan was using his 56" Zipper SXT, 51 lbs bow, 300 Abowyer wapiti broadheads on Easton Full Metal Jacket 500's, and his Ambush Saddle. Congrats on another great buck! Will Cocke with 3 nice bucks that he has taken this year. The top buck was taken with a Abowyer wapiti and the other two bucks were taken with a Abowyer large bonehead. Nice shooting on three nice looking bucks. "The shot was about 30-35 yards between trees and the arrow went clean through him! After dressing him, I also found the arrow had cut through two ribs, once on entry and again on exiting. I do not believe any other broadhead could have done that at such a distance! He also did not get far before expiring. I want to thank you for making such a great product; if I ever get the chance, I will try them out for myself in Africa!" 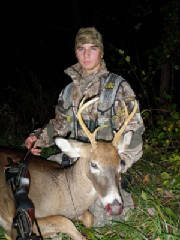 Daniel Bergsma took this nice Michigan buck with an Abowyer bonehead lite. 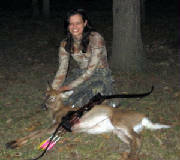 He shot it at 35 yards and the deer only traveled about 60 yards before quickly expiring within sight. Congratulations on an excellent deer Daniel. Here is Jerry Karbon with a nice ten point buck he took in Northwest Wisconsin. 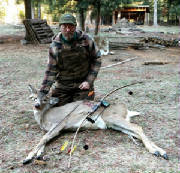 Jerry was using an Abowyer wapiti and his 64" 52# ACS longbow. The arrow was a Sweetland 625 grain compressed cedar shafts. Nice work on a great deer Jerry. Here is Ed Pylman with two very nice Iowa bucks. Ed was using an Abowyer Bonehead for both deer. Ed states, "I have not lost an animal since I have been shooting your heads. Thanks for making such an awesome head.!!" Well thank you Ed and congratulations on yet another couple of excellent deer. Cody Bos with a nice Michigan six point taken on his fathers land in Ravenna Michigan. This buck was taken with a 120 grain Abowyer bonehead lite with 25 grain adapter on a Gold Tip 5575 for a total arrow weight of 420 grains. Scott Vrtiska with a nice antler-less deer taken with an Abowyer brown bear. The brown bear cracked squarely through the leg-bone and penetrated directly into the center of the heart. 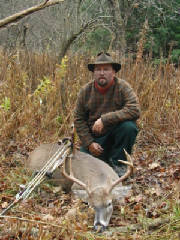 Here is Tony Gucciardo’s excellent non-typical 15 point southern Illinois buck. Tony shot this big buck with a 130 grain Abowyer and a 30 grain screw in adapter. 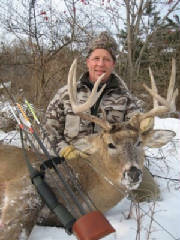 Here is Kurt Huizinga with another big Iowa Buck. Kurt took this big deer with an Abowyer bonehead. 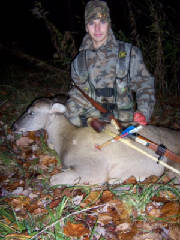 Here is Jean-Pierre with a big Pennsylvania doe. He used a Abowyer Brown Bear on a whispering winds shaft weighing 583 grns and Hoots longbow that is 49# at 28”. Great shooting Jean-Pierre! Don Batten with another buck taken with an Abowyer brown bear. Deer only traveled 60 yards before expiring. Here is Rob Davis with a 205 lb field dressed Maryland buck. Rob used the Large Bonehead and a Predator bow to take down this huge buck. Tracy Dunn from Zipper bows with two does and one buck all shot in her FIRST traditional bow hunting season with and Abowyer brown bear. Bryan George took yet another excellent deer this year. He really put his Abowyer broadhead to good use on this large nine point buck. He also shot it out of his own homemade ground blind. Nice shooting Bryan. Keep it up! 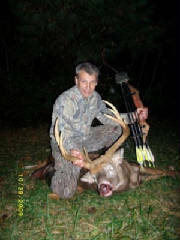 Bryan George took this nice West Virginia deer with a 250 grain wapiti broadhead and a zipper bow. Way to go Bryan! 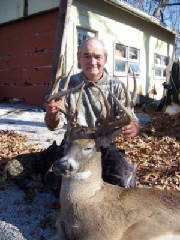 Bob Brown took this excellent New York buck with an Abowyer brown bear. Tracy Dunn with a nice antlerless deer taken with her 39# zipper bow and an Abowyer brown bear that got a full passthrough. Don Batten with his big North Carolina buck taken with an Abowyer brown bear. Don was shooting a 42lb ACS bow and achieved a total pass-through. This deer only traveled 27 yards before expiring. This makes the fourth deer and one big boar using the same broadhead for Don. Nice shooting and keep it up!